This nutty and fruit biscotti are packed with slivered almonds and dried Turkish apricots, making them the perfect pairing to your morning coffee! If you know me, you know I love dunking treats into my coffee. The first time I met Nutmeg Nanny, I shocked her by dipping my buttery croissant into my black coffee! She got used to me and my crazy habits quickly. That being said, I’m a huge dunker. I’ll dunk everything from a doughnut to a grilled cheese sandwich (seriously, give it a try!) into my coffee and biscotti might just be the most perfect items to dunk. Their slender shape and sturdy body allows for a longer-timed dunk, soaking up the richness of my espresso. These Almond Apricot Biscotti (note: apricots turn dark brown when baked for too long, maybe the sulphur in the dried fruit?) are the ideal cookie to bake up and store for weeks on end. They won’t go soft as easily as a chewy cookie and you’ll love waking up to a not-so-sweet treat you can dip in your morning java. Today, we’re also celebration National Almond Day (isn’t it fun that almost every food has it’s own foodie holiday?)! Thanks to my friends over at the California Almond Board, I’ve listed below some almond “life hacks” or suggested ways to see almond products in a whole new light! Mix up banana, almond butter and almond milk for a delicious smoothie with a punch of protein. Each one ounce serving of almonds has 6 grams of protein, and this recipe packs 33 grams of protein per serving. DIY almond milk also produces leftover almond meal! Use as a thickening agent in soups or stews. Thai recipe come out too spicy? Mix in almond butter to tame the spice & create a more palate-friendly meal. 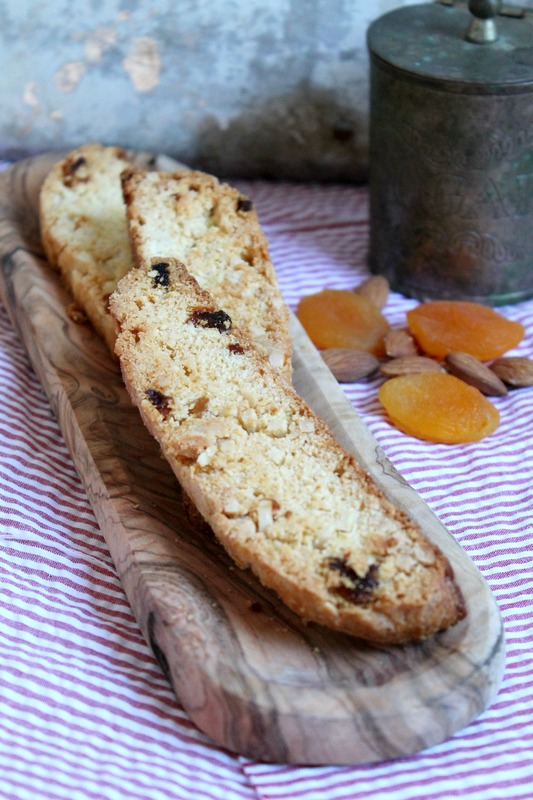 These Almond Apricot Biscotti are the perfect treat to pair with your coffee or afternoon tea. Preheat oven to 350F and lightly grease a baking tray. Cream the butter, sugar, vanilla, and salt together. Incorporate eggs and mix. Dump in flour, baking powder, chopped apricots, and almonds. Mix on low speed until the ingredients come together. Add half and half to make a more manageable and moist dough. Form into large log and brush with egg wash. Bake for 25-30 minutes, until only slightly golden brown. Let cool for 5 minutes and slice biscotti log into 3/4" to 1" thick cookies. Arrange sliced cookies on baking sheet and continue to bake for 25-30 more minutes, until they feel dry. (I like to flip them over halfway through this second baking). Remove from oven and let cool completely before storing. Disclaimer: The California Almond Board sent me almond ingredients free of charge, but I was not under any obligation to post about them. 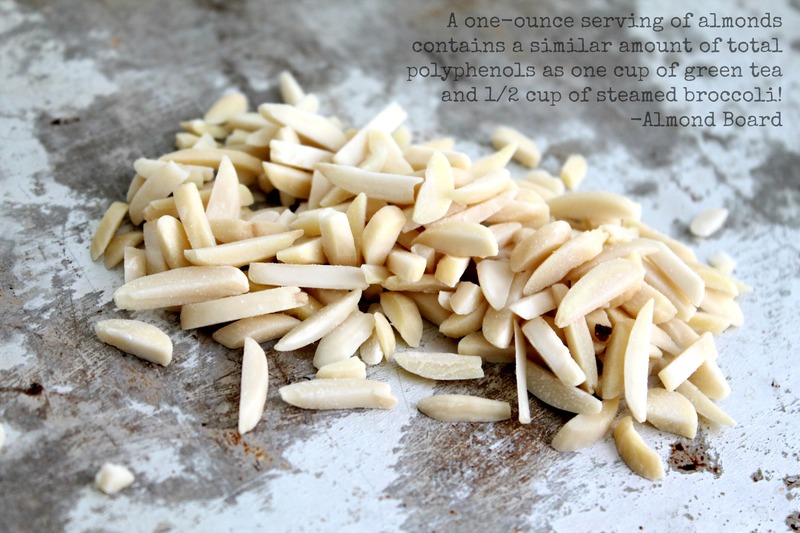 I did because this is an awesome recipe and I truly love almonds! « What does a Master Chocolatier do?